Draft: 2002, Minnesota Twins, 6th rd. record (18 vs Detroit, 4/15/01), single-season strikeout record (118, 2001) and career strikeout record (280)… Named a 2001 Cape Cod League All-Star with Wareham… Hobby: Collecting baseball cards and sports memorabilia, which he chronicles on his website (eteamz.com/PatNeshek)… Signed by: Billy Milos. Began season on the 10-day DL with a right shoulder strain and was activated on 7/1; included rehab assignments with Clearwater (A), 6/23-25, and Reading (AA), 6/26-30...Did not allow a run in each of his first 11 appearances of the season (9.2 IP)... Posted a 1.13 ERA (3 ER, 24.0 IP) in 29 of his 30 appearances (allowed 4 ER in 0.1 IP on 9/21)... His 5 saves were one short of his career high set in 2014...Allowed his first career run at Citizens Bank Park on 8/3 after beginning his career with 28 straight scoreless appearances at the venue... Was believed to be the first player in baseball history to wear No. 93. Selected to his 2nd career All-Star Game (1.0 IP, H)... Made 5 scoreless appearances for the World Baseball Classic champion Team USA... Among all NL relievers, ranked 1st in BB/9.0 IP (0.87), 2nd in ERA (1.59) & SO/BB ratio (11.50) and 3rd in WHIP (0.87)... Began the season with the Phillies... Each of his 23 appearances at Citizens Bank Park were scoreless (21.2 IP)... 61 of his 71 appearances were scoreless, including each of his first 14 (4/5-5/13)... Had a 0.72 ERA through his fi rst 25.0 IP, lowest by a Phillies reliever to start a season since Brad Lidge in 2008 (also 0.72)... Was on the paternity list, 4/19-20, for the birth of daughter, Skye... Traded to COL on 7/26... Posted a 2.45 ERA with 24 strikeouts to 1 walk in 28 appearances for COL... Pitched 1.1 innings in the NL Wild Card Game at ARI, 10/4. Was on the Opening Day roster for the first time with the Athletics...Spent the entire season with Oakland with the exception of one week with Sacramento (AAA) at the end of August...Appeared in 45 games, his most at the big league level since he tallied a career-high 74 with Minnesota in 2007...Allowed a .252 batting average, the highest mark of his career and struck out 29 batters in 40.1 innings for a career-low average of 6.5 strikeouts per nine innings...Did not commit an error in five chances and has not made an error in 226 games and 27 chances in his career...Tossed a season-high 2.1 scoreless innings vs. DET (4/13) to start a 24-game stretch through 6/25 where he did not allow a run in 21 of 24 games. Had a 1.17 ERA and .226 opponents batting average over that span...Retired the side in order in the 9th inning at TEX (5/20) in the 200th appearance of his career...Had a season-best 1.08 ERA in nine games in May...Appeared in two games with Sacramento, both at Tacoma, and allowed two unearned runs in 2.0 innings. Returned to Oakland 9/3 when Sacramento's season ended and did not allow a run or a hit in four outings following his return. Was acquired from the Baltimore Orioles organization Aug. 3 for cash considerations after going 3-2 with 11 saves and a 2.66 ERA in 35 appearances at Triple-A Norfolk...then went 2-1 with a 1.37 ERA and .147 opponents batting average in 24 appearances with the A's...the ERA and opponents batting average were the lowest marks of his career...as was his .221 opponents on-base percentage and .309 slugging percentage...allowed a .094 (5-for-53) batting average against right-handed hitters compared to .333 (5-for-15) against left-handers...surrendered two of his three home runs to lefties for a .733 slugging percentage...righties slugged .189...opponents were 1-for-15 (.067) with runners in scoring position, including 0-for-8 with RISP and two outs...has allowed a .166 (26-for-157) average with RISP in his career...first batters faced were 3-for-18 (.167) with three walks, a hit by pitch and two sacrifice flies...they are batting .147 (23-for-156) with a .229 on-base percentage in his career...allowed 5-of-17 (29.4%) inherited runners to score...was charged with two blown saves...opponents were 2-for-26 (.077) with two outs but both of the hits were home runs...did not allow a run (10.2 ip) and had a .061 opponents batting average in 11 appearances in Oakland...had a 3.00 ERA and .229 opponents average in 13 road games...has not allowed a run in 13 career appearances in the O.co Coliseum (13.0 ip)...did not commit an error in 24 games and has no errors in 181 career appearances (22 total chances). Was claimed off waivers by San Diego from Minnesota on March 20...Made the Padres Opening Day roster...Earned the win on Opening Day, March 31 @STL, his .rst win since August 15, 2007 @SEA...Had four separate stints with San Diego in 2011...Went 1-0 with a 2.16 ERA (16.2IP, 4ER) and a .203 (12-59) opponents batting average over his .rst 16 outings, March 31-June 10...Worked scoreless ball in 16 of his 25 outings for San Diego, including nine of 14 at home...Posted a 3.46 ERA (13.0IP, 5ER) over 14 outings at home for San Diego...Pitched to a 4.63 ERA (11.2IP, 6ER) in 11 outings on the road...Designated for assignment on September 1 and outrighted to Triple-A Tucson on September 6. Started the season on the Twins Opening Day roster for the third time in his career (missed 2009 with injury)...Made six appearances for the Twins and did not allow a run in his first five appearances (4.1 ip)...season-high with 2.0 innings pitched, April 14 vs. Boston...Placed on the 15-day disabled list with inflammation in his right middle finger, May 2-June 5...returned from rehab assignment at Single-AFt. Myers and was optioned to Triple-A Rochester...appeared in 30 games for the Red Wings, all in relief...Posted a four-game win-streak, June 29-August 3...recorded only save of the season, August 7 at Syracuse...Did not allow a run in nine consecutive appearances (11.1 ip), July 27-August 20...Went 2-0, 5.21 (19.0 ip, 11 er) in 13 games before the All-Star break and 3-1-1, 2.66 (20.1 ip, 6 er) in 17 games after the break with Rochester...Was recalled by the Twins, September 6...Set a career-high with three walks in a scoreless inning, September 19 vs. Oakland...Set a season-high with three strikeouts, September 25 at Detroit...it marked his first outing with three strikeouts since March of 2008. Missed the entire season recovering from "Tommy John" surgery on his right elbow. Had season-high three strikeouts, March 31 vs. Los Angeles (AL)...did not allow a run in seven appearances (5.1 ip), April 17-30...placed on 15-day disabled list with an acute partial tear of the ulnar collateral ligament in his right elbow, May 9. Had 17.0 inning scoreless streak, April 21-May 26...did not allow a run in 11 consecutive appearances, going 1-0, 0.00 (10.1 ip), May 29-June 22...was one of five players on the Final Vote Ballot for the 2007 All-Star Game...did not allow a run in nine appearances, going 2-0, 0.00 (7.1 ip, 0 er), July 7-21...tied season-high three-game win-streak, July 15-28...tied season-high three strikeouts, July 18 vs. Detroit...tied season-high 2.0 innings, September 4 vs. Cleveland...had .183 batting-average-against with lefthanders batting .181 (17-for-94) with three home runs and righthanders batting .185 (27-for-146) with four home runs...stranded 45 of 59 (76%) inherited runners and first-batters-faced in relief were 8-for-62 (.129) with 22 strikeouts...tied for fifth in American League in games. Began season at Rochester...was 0-0, 0.00 (9.1 ip) with three saves, April 6-21...did not allow a run in six appearances, going 1-0, 0.00 (11.1 ip), with two saves, April 29-May 12...was 2-0, 0.52 (17.1 ip, 1 er) with six saves in nine appearances, May 17-June 6...selected toTriple-A All-Star Game, July 12 at Toledo...recalled and made Major League debut, July 7 at Texas...did not allow a run in ﬁve appearances (7.0ip), July 7-23...recorded ﬁrst Major League win, July 30 vs. Detroit...did not allow a run in nine appearances striking out 19 and walking just one,July 30-August 23...struck out a season-high four, twice, August 1 vs. Texas and August 12 vs. Toronto...recorded his second win August 16 vs.Cleveland as he retired the only batter he faced...recorded his third win in his next outing August 18 vs. Chicago (AL) with 1.1 scoreless innings...pitched 2.0 scoreless innings recording three strikeouts, September 28 vs. Kansas City...went 4-0 with a 0.90 ERA and held opponents to a .181average at the Metrodome...stranded 26 of 29 (90%) of inherited runners and ﬁrst-batters-faced in relief were 4-for-31 (.129)...named to Topps' Triple-A All-Star Team as top relief pitcher. Did not allow a run in 14 of 15 appearances, going 2-0, 0.92 (19.2 ip, 2 er) with 5 saves, April 18-May 29 . . . tied season-high 5 strikeouts, June 20 vs. Binghamton . . . did now allow a run in 9 of 10 appearances, going 2-1,1.69 (16.0 ip, 3 er) with 4 saves, June 24-July 20 . . . season-high 3.0 innings, July 19 at Binghamton . . . was 0-0, 0.55(16.1 ip, 1 er) with 7 saves in 11 appearances, August 4-26 . . . averaged 10.4 strikeouts per-9-innings . . . led Twins'minor leaguers in saves. Began season at New Britain . . . did not allow a run in 10 appearances, going 1-0, 0.00 (10.0 ip) with 1 save, May 5-June 5 . . . was 1-0, 0.00 (7.2 ip) with 1 save in 5 appearances, June 17-July 1 . . . season-high 4.0 innings and4 strikeouts, July 5 vs. Trenton . . . transferred to Ft. Myers, July 15 . . . did not allow a run in 10 of 12 appearances,going 0-0, 1.32 (13.2 ip, 2 er) with 9 saves, July 17-August 20 . . . led club in saves. Began season at Quad Cities . . . did not allow an earned run in first 13 appearances, going 2-1, 0.00 (14.1 ip) with 5 saves, April 5-May 4 . . . Twins' Minor League Player of the Week, April 12-18 . . . Twins' Minor League Pitcher ofthe Month for April . . . did not allow a run in 13 of 14 appearances, going 1-0, 0.50 (18.0 ip, 1 er) with 9 saves, May12-June 21 . . . season-high 5 strikeouts, June 12 at Peoria . . . named to Midwest League All-Star team, June 17 at WestMichigan . . . promoted to Ft. Myers, June 23 . . . was 3-0, 1.64 (11.0 ip, 2 er) in 7 appearances, June 26-July 11 . . .did not allow a run in 9 of 11 appearances, going 1-0, 1.29 (14.0 ip, 2 er) with 2 saves, July 17-August 6 . . . promotedto New Britain, August 12 . . . tied season-high 3.0 innings, August 17 vs. Portland . . . was third among Twins' minorleaguers in saves . . . pitched for Grand Canyon in the Arizona Fall League. Was 0-0, 0.00 (4.0 ip) with 3 saves in 4 appearances, June 26-July 4 . . . did not allow an earned run in 19 consecutive appearances, going 0-1, 0.00 (19.2 ip), July 11-August 20 . . . season-high 3.1 innings, August 5 vs. Bristol. . . tied season-high 4 strikeouts, August 20 at Kingsport . . . led club and was second in league in saves . . . was fifthamong Twins' minor leaguers in saves. July 1, 2018 Philadelphia Phillies activated RHP Pat Neshek from the 10-day injured list. June 26, 2018 Philadelphia Phillies sent RHP Pat Neshek on a rehab assignment to Reading Fightin Phils. June 26, 2018 sent RHP Pat Neshek on a rehab assignment to Reading Fightin Phils. June 23, 2018 Philadelphia Phillies sent RHP Pat Neshek on a rehab assignment to Clearwater Threshers. March 30, 2018 Philadelphia Phillies placed RHP Pat Neshek on the 10-day disabled list. Right shoulder strain. 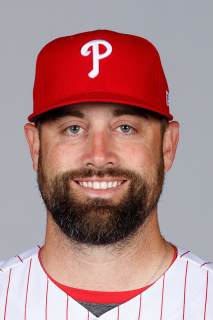 December 15, 2017 Philadelphia Phillies signed free agent RHP Pat Neshek. November 2, 2017 RHP Pat Neshek elected free agency. April 21, 2017 Philadelphia Phillies activated RHP Pat Neshek from the paternity list. April 19, 2017 Philadelphia Phillies placed RHP Pat Neshek on the paternity list. November 4, 2016 Houston Astros traded RHP Pat Neshek to Philadelphia Phillies for Player To Be Named Later. December 12, 2014 Houston Astros signed free agent RHP Pat Neshek. October 30, 2014 RHP Pat Neshek elected free agency. March 30, 2014 St. Louis Cardinals selected the contract of RHP Pat Neshek from Memphis Redbirds. February 6, 2014 St. Louis Cardinals signed free agent RHP Pat Neshek to a minor league contract and invited him to spring training. February 6, 2014 RHP Pat Neshek assigned to Memphis Redbirds. November 5, 2013 RHP Pat Neshek elected free agency. October 12, 2013 Oakland Athletics activated RHP Pat Neshek. October 4, 2013 Oakland Athletics reassigned RHP Pat Neshek to the minor leagues. September 3, 2013 Oakland Athletics selected the contract of RHP Pat Neshek from Sacramento River Cats. August 28, 2013 Oakland Athletics sent Pat Neshek outright to Sacramento River Cats. August 26, 2013 Oakland Athletics designated Pat Neshek for assignment. August 3, 2012 Oakland Athletics selected the contract of RHP Pat Neshek from Sacramento River Cats. August 3, 2012 Norfolk Tides traded RHP Pat Neshek to Sacramento River Cats for cash. April 4, 2012 Pat Neshek assigned to Norfolk Tides. January 30, 2012 Baltimore Orioles signed free agent RHP Pat Neshek to a minor league contract and invited him to spring training. September 29, 2011 RHP Pat Neshek elected free agency. September 6, 2011 San Diego Padres sent Pat Neshek outright to Tucson Padres. September 1, 2011 San Diego Padres designated Pat Neshek for assignment. August 26, 2011 Tucson Padres activated RHP Pat Neshek. August 24, 2011 San Diego Padres optioned RHP Pat Neshek to Tucson Padres. August 21, 2011 San Diego Padres designated Pat Neshek for assignment. August 14, 2011 San Diego Padres recalled RHP Pat Neshek from Tucson Padres. July 29, 2011 San Diego Padres optioned Pat Neshek to Tucson Padres. July 26, 2011 San Diego Padres recalled Pat Neshek from Tucson Padres. July 9, 2011 San Diego Padres optioned Pat Neshek to Tucson Padres. May 17, 2011 San Diego Padres recalled Pat Neshek from Tucson Padres. April 24, 2011 San Diego Padres optioned Pat Neshek to Tucson Padres. March 20, 2011 San Diego Padres claimed RHP Pat Neshek off waivers from Minnesota Twins. October 13, 2010 Pat Neshek roster status changed by Minnesota Twins. October 6, 2010 Minnesota Twins reassigned RHP Pat Neshek to the minor leagues. September 7, 2010 Minnesota Twins recalled Pat Neshek from Rochester Red Wings. June 5, 2010 Minnesota Twins optioned Pat Neshek to Rochester Red Wings. June 5, 2010 Pat Neshek assigned to Rochester Red Wings from Fort Myers Miracle. June 2, 2010 sent RHP Pat Neshek on a rehab assignment to Fort Myers Miracle. May 2, 2010 Pat Neshek roster status changed by Minnesota Twins. November 10, 2009 Minnesota Twins activated RHP Pat Neshek from the 60-day disabled list.